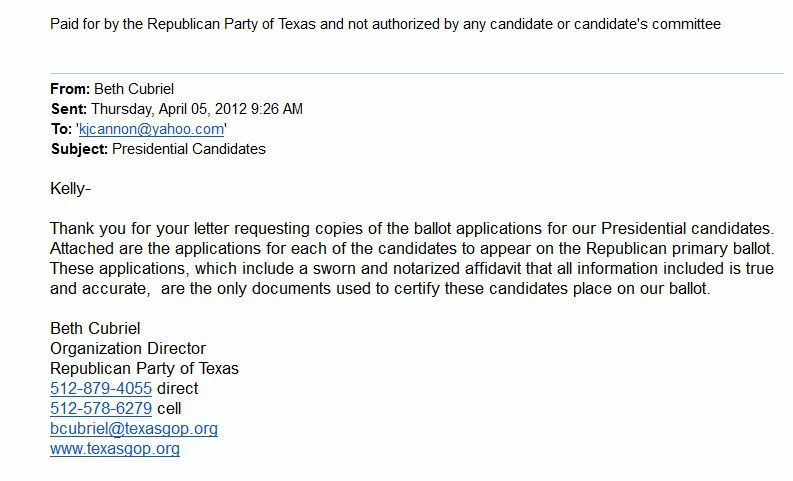 Thanks to the Republican Party of Texas (“RPT”) I am able to amend some misleading information I posted in the previous article, BALLOT ENTITLEMENT LAWS should DISQUALIFY PRESIDENT OBAMA in TEXAS. How they came to aid in this clarification, is a hoot! On Wednesday, April 18, at around 5:30 PM EDT, I received a call from kjcanon, in TX. “Are you sitting down?” Needless to say, I was by the time I answered her question. Here are those RPT emails. Notice that 2 documents were attached: one, designated “20120405091443653.pdf,” which contained multiple candidate applications to the ballot; and the other designated “order on party conventions.pdf.” This second attachment leads to the other subject raised by Mr. Lewis, which we will discuss first. purposes of modfications (sic) to party rules made pursuant to this order. Mr. Lewis, again obviously referencing the article he had read here on the “jbjd” blog, now informed kjc that, according to item “d” of this redistricting court order; the RPT wasn’t required to submit its rules to the SoS by January 5, the date which appears in the statute, in order to preserve the entitlement of their candidates to appear on the ballot, anyway! He would send along that court order for her reference. Before I complete the discussion of the rules, I want to focus on the other attachment which came in the mail, the Presidential candidate applications. 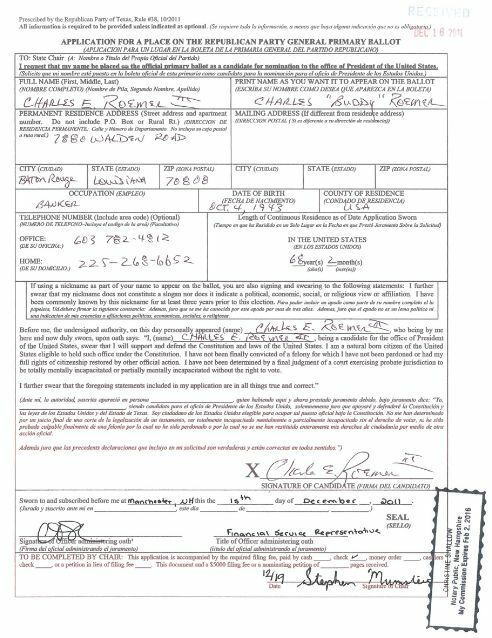 According to Mr. Lewis, the applications “are the only documents used to certify these candidates place on our ballot.” So, we looked for something in the form which confirms that the candidate has established meeting “federal” “qualifications.” Here is the form submitted by Charles “Buddy” Roemer. Notice that this contains an oath or affirmation from the applicant swearing s/he satisfies the Constitutional requirements for the job. Either way, neither the RPT nor the TDP can be said to ‘certify’ a Presidential candidate has met federal qualifications when the only basis for that certification is the candidate’s self-authentication. a. 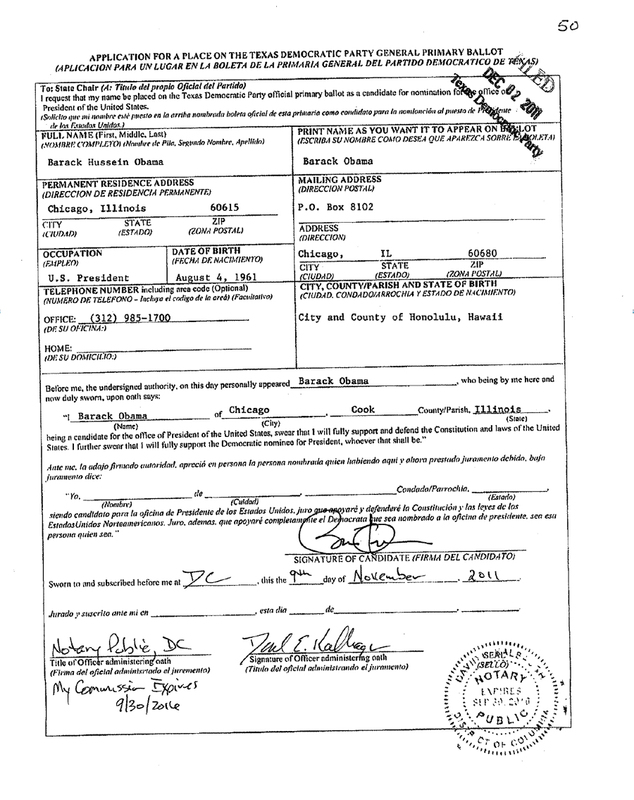 Filing: Any person eligible to hold the office of President of the United States may qualify to participate as a Presidential candidate in the presidential primary by filing with the State Chairman, not later than 6:00 p.m. the second Monday in December of an odd-numbered year preceding the presidential primary, a signed and acknowledged application for his or her name to be placed on the Presidential Primary ballot, accompanied by a supporting petition signed by a minimum of 300 registered voters of the state from each of a minimum of fifteen (15) Congressional Districts, or the payment of a filing fee of $5,000. So, yes, both the TDP and the RPT filed ‘rules’ with the SoS by deadlines created either in the statute or through the court order(s). But neither party preserved its entitlement to the ballot by filing a rule that spelled out how it would determine conclusively so as to certify to the Sos; both the Presidential and Vice Presidential candidates are federally qualified for the job. This entry was posted on Thursday, April 19th, 2012 at 19:04 and is filed under Uncategorized. You can follow any responses to this entry through the RSS 2.0 feed. You can leave a response, or trackback from your own site. This just gets better and better:) Will there be a movie? once again I would like to thank you so very much for backing me up in the little bruhaha over at Citizen Wells. I don’t know if you have been there as of this evening but the discussion is getting dumber and dumber. some of those over there are stellar debaters but others are just plain …well…aargh! I sincerely hoped that I had found a site that would provide a vehicle to inform the general public in a way that would both provoke thought and educate at a level suitable and useful for the common person. Apparently I was mistaken. Wells has chimed in a couple of times but to no apparent notice. I can say this however, that I now understand how, as a nation of collective souls, we got into this mess`we are in, if those at Wells are a fair representation of that cross-section. By the way, I do believe we had civics courses back when those people were in school…didn’t we? Was the education system failing us so badly even then? I might add that I definitely have a greater appreciation for what you have been exposed to over there. coldwarvet2: Wow. It sounds like it’s a good thing I have been too busy to ‘check in’ recently. When I began posting there, I realized my politics were, for the most part, ‘different’ from the majority. But I liked the general enthusiasm. Soon, I realized, some of the posters were extreme – often misogynistic, homophobic, racist, and anti-Semitic – and were seldom called out on their extremist views. (I occasionally dropped a line to CW to point out grossly inappropriate language, etc., and he was quick to remedy the infraction.) But something I want to point out to you, given your relatively recent appearance over there. Throughout these past few years, several of the posters over there have been staunch ‘supporters’ of several of the popular ‘birthers.’ This means, they promote the work, on that blog and others; and they contribute financially to others’ endeavors. Some of the people there benefit from such financial contributions. In general, I have negatively critiqued work in the ‘eligibility’ arena that does not focus on state electoral systems; or which focuses on President Obama; or which advocates mass action against a state office, or a state court. I also reject hyperbolic rants and rags. I could not care less that this has made me unpopular over there; I still printed what I thought provided solutions to so many of the problems expressed in comments over the years. Because all the time I was thinking, if we could just harness this patriotism into correct channels then, we could change those things we have recognized need fixing. I don’t usually get into people’s heads like this. But I want you to know, I take none of this seriously. I get this vitriol from both the left and the right. 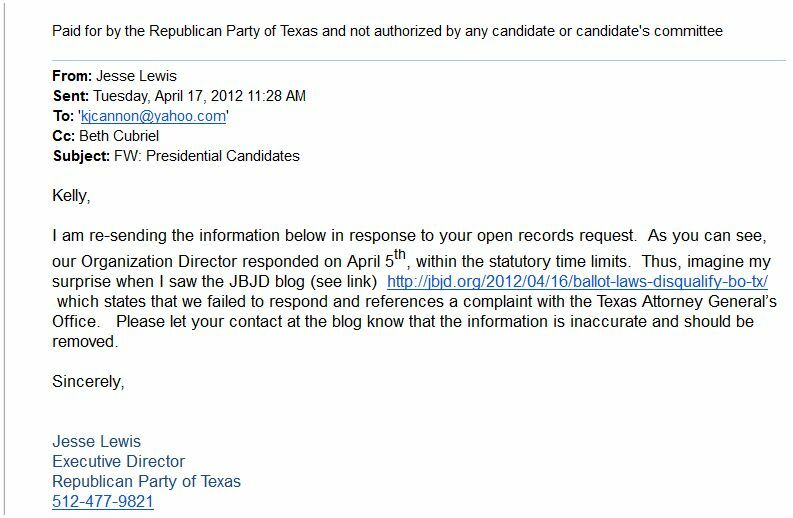 For example, as I have pointed out, fogbow spent page after page ripping apart my TX strategies, especially ridiculing me for saying party chairs in TX are public officials for the purpose of open records requests. ‘It’s not in the definition of public officials!’ (Yes, but it’s in the definition of political party chairs! )Of course, we now have the evidence, I was right. While I am aware you have the orange fingernails and all, I know it helps sometimes to know you are being heard …by someone out there. I believe I’ll let the mutual admiration society over at CW chill for a while….